From 2008 through 2013, the Adoptee Rights Coalition worked to raise public awareness outside the National Conference of State Legislators with an annual Adoptee Rights Demonstration. During those years our demonstration grew to include hundreds of protesters representing all members of the adoption constellation: adoptees, first parents, adoptive families, as well as industry professionals. We were followed at times by documentary crews. 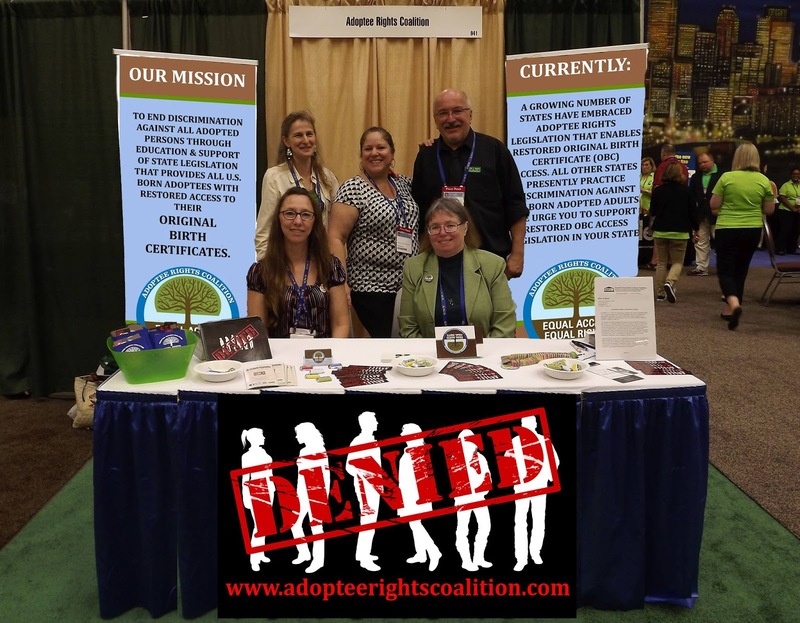 Those demonstrations generated interest in Adoptee Rights and was a way for the adoption commuity to come together once a year. While the protest happened outside the convention center each year, there was work going on inside the building as well at the NCSL Annual Legislative Summit. The Legislative Summit is the largest convention of the NCSL. Over 5,000 legislators, legislative staff, government officials, business representatives, union members, foundation representatives and others interested in public policy are in attendance. The National Conference of State Legislatures is the largest group of its kind, the national organization of state lawmakers. 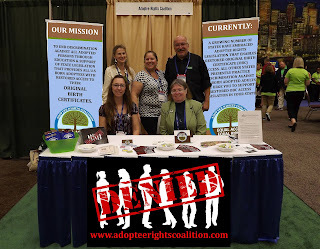 Now that awareness and interest has been generated through our annual demonstration, the Adoptee Rights Coalition believes maintaining a presence inside the exhibit hall is the best way to reach legislators from all 50 states. The Exhibit Hall is open for three days during the convention, during which time the booth is staffed by those with legislative experience in their home States. During our time in the booth, we collect contact information to provide follow up correspondence with legislators, staff and other attendees during the year. Our state legislators are able to meet with us in a relaxed, casual atmosphere, and have the opportunity to learn about Adoptee Rights in a venue conducive to education. Over the past ten years, our booth has become a very popular spot for legislators and their staff to come and chat. 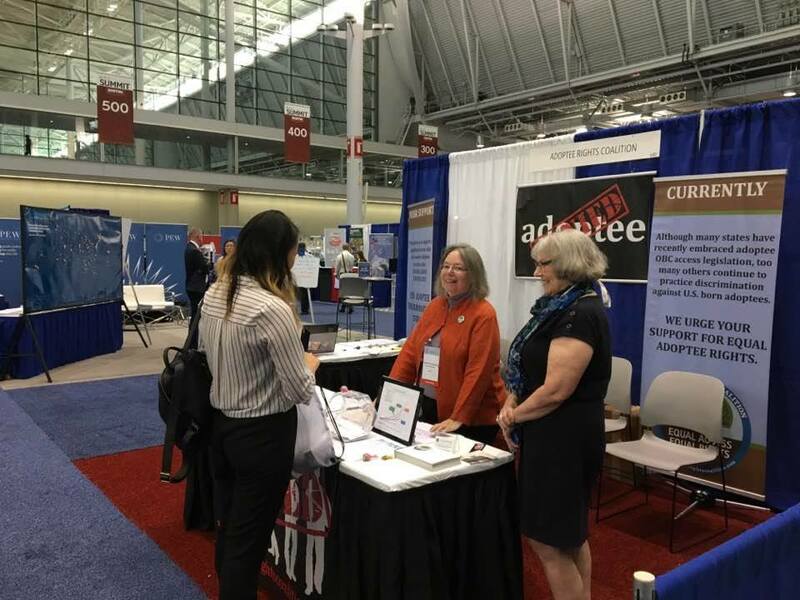 The Adoptee Rights Coalition is proud to be an NCSL Exhibitor. Each year that we are invited back to participate in this esteemed opportunity, it is a direct reflection of the hard work of each of our supporters. For this, we could not be more appreciative. Next year, we will be in Los Angeles for the 2018 Legislative Summit and fundraising has already started as half of the booth payment is due in October. Donations can be made through Paypal using the link below. Each donation goes directly into the fund to rent and furnish the booth space. Our volunteers donate their own time and money for lodging and transportation to attend each year.